A dusting of snow earlier this week made it easy to see who’s been out and about in the neighborhood. 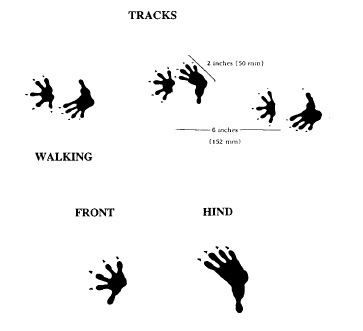 Bird tracks don’t provide much insight into genus and species, but opossum tracks are recognizable enough. Several of them—or maybe it was one very busy guy or gal—live along a favorite walking route of mine. 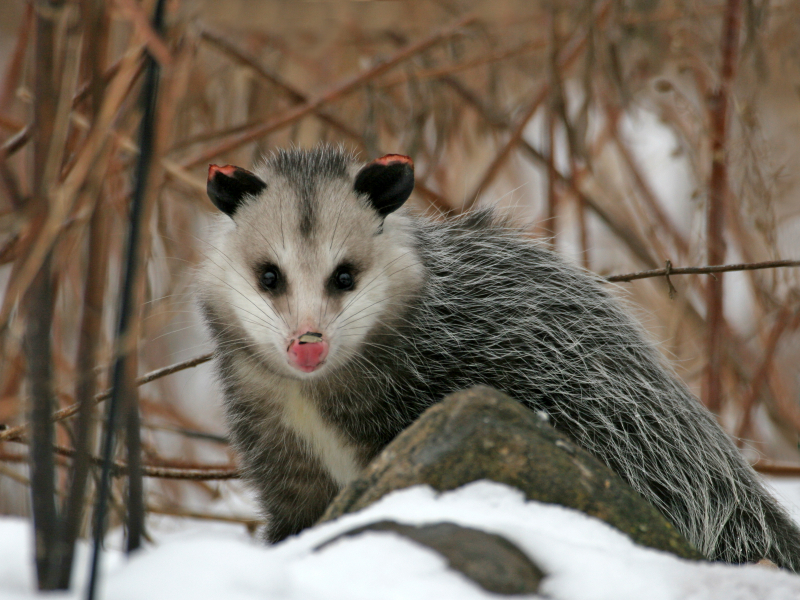 Opossums are down with life in and around town, in part because they are the penultimate omnivorous opportunists. 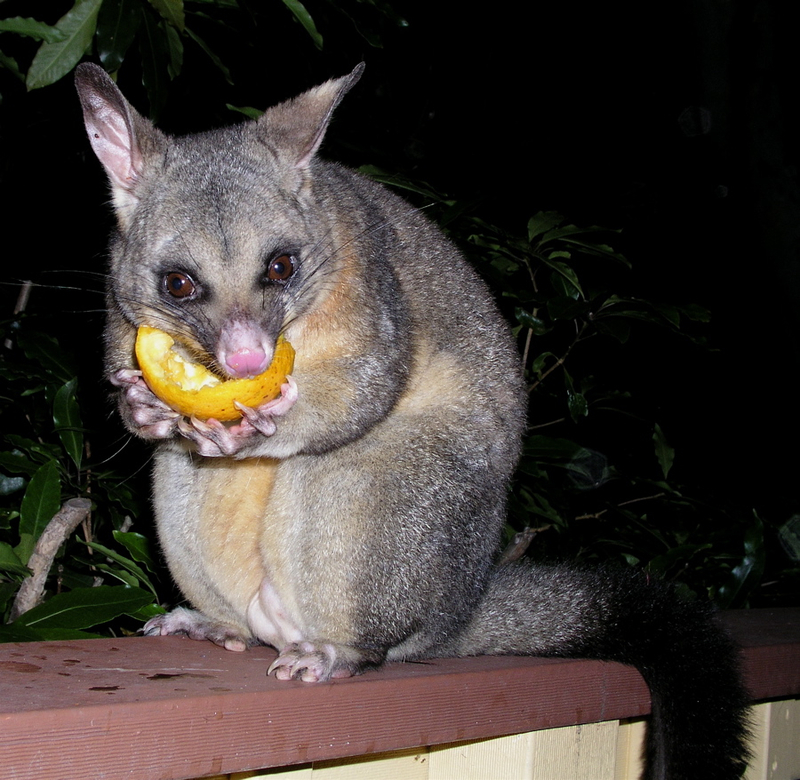 In addition to their “traditional” cuisine, which features insects, small vertebrate animals, wild fruits (including persimmons, a special treat), and carrion, ‘possums are known to take advantage of uncovered garbage bins (not without risk, as they often fall in and become trapped) and bird feeder spillage. They’re not shy about venturing through a pet door now and then either, especially if there’s a beckoning bowl of kibble on the other side. This can come as quite a shock—to both parties—when the homeowner wanders into the mudroom or kitchen expecting to say good morning to Garfield or Odie. If ever there was a creature in need of a good spin-doctor, it’s North America’s only marsupial. The Aussie cousins—kangaroos, wallabies, koalas, sugar gliders, even wombats—have somehow garnered a higher charismatic ranking than poor old Didelphis virginiana. Their long snout, gray fur, and naked tail cause many city and suburb folks to mistake them for rodents, and this may be the root of their public relations problems. I remember a wildlife center phone conversation with a woman who was surprised when an opossum wandered through the pet door into her laundry room. Eventually, I was able to calm her down a bit and convince her she was not dealing with a freak-of-nature rat, but my attempts to help her appreciate the natural beauty standing in front of her dryer fell on deaf ears. Startled Woman: I’m sorry, but I can’t even stand to look at him… he’s just so UGLY! Indignant Wildlife Biologist (that would be me): Well, ma’am, he’s probably thinking the same thing about you! Not one of my finest Wildlife Hot-Line moments, I know, but the words were tumbling off of my tongue before I had a chance to bite it. I happen to find opossums quite handsome. Still, there’s no denying that rodent resemblance. If you are mouse-and-rat adverse you’ll probably never come to think of ‘possums as pretty. 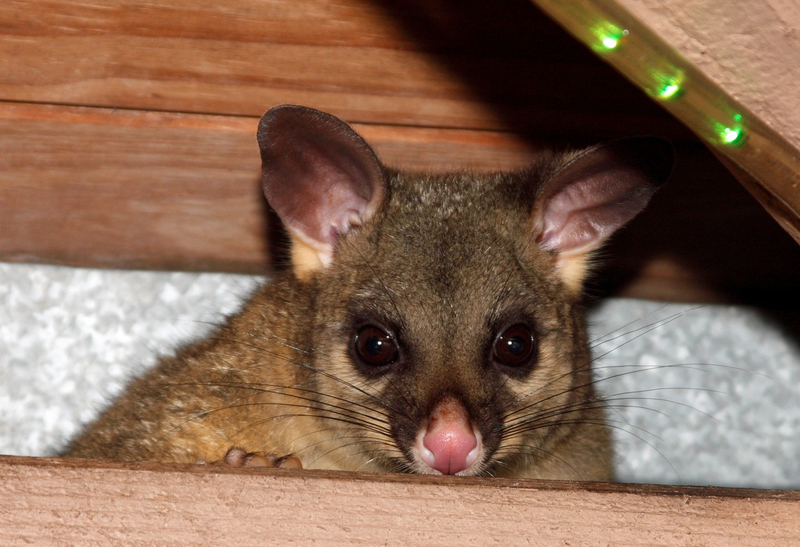 There’s another problem—it’s a common misconception that ‘possums are clumsy, dirty, and not all that bright, with poor vision and hearing to boot. Personally, I think any species that’s managed to survive relatively unchanged since the Cretaceous deserves a little more credit. Modern humans arrived on the scene nearly 90 million years later, so perhaps we should be a little more respectful of our elders. Opossums are actually quite clean. They carefully groom themselves during and after eating—even the babies. When it comes to the acuity of their senses, common knowledge has it all wrong. 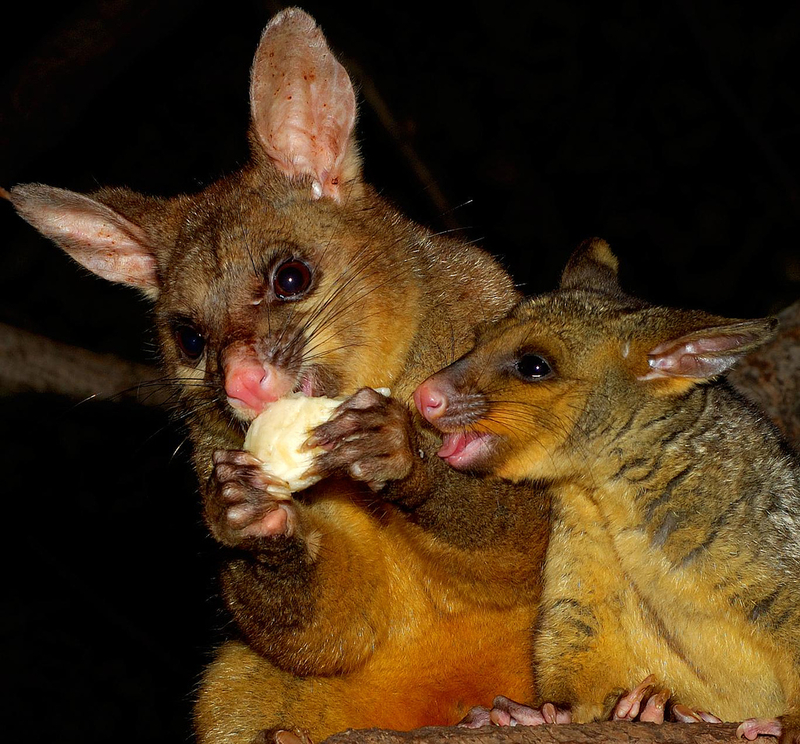 These marsupials have excellent hearing and can easily detect the rustling of prey hidden under dry leaves or tree bark. A wildlife rehabilitator friend who works extensively with opossums tells me they evolved with a focus on olfactory sensitivity and, as a result, have an extraordinary sense of smell. Their sight is about average for mammals, but because they are primarily nocturnal, their eyes are adapted to working under low-light conditions. Our daytime is their night and, as a result, they can appear rather dazed and confused in sunlight. Kind of like me when I’m up past my bedtime.